Yes- You made it!! First time! 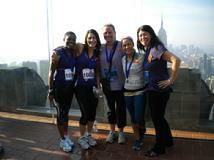 March 1st, team All About You.. climb 66 flights with determination, enthusiam and courage. Several of my teammates improved their times. Yay! Way to go! After the climb, my new teammate was stopped by a gentleman. He said, "you inspired me." He was so impressed with your effort and determination because it wasn't easy. The day was a success! I was so happy for everyone. Thank you Team All About You... your efforts were noticed.. Your spirit was grand. I also want to thank all my friends and family who support all of us with donations and encouragment. Our team has raised over $9000. I am very proud. Thank you! Below are the amazing results from our 30-day weight loss challenge in August. I am proud of each and every one of them. It was a challenge with great rewards. I trained each group online twice a week for 50 minutes. That was the constant element in each group. The variables were in the food plan. In Group A, they followed my detailed food plan for the month. The cost was extra but the food plan was ready and all the clients had to do was plan, cook and eat accordingly. Everyone maintained a food journal, which I closely monitored. In Group B, they had a simple list of foods to choose from and a basic food plan. They had to determine what foods to eat from the list. I only asked them to write a food journal if they were confused or unsure of the program. Group C only followed my training and maintained their current food plan. Lost 3 lbs Measurements to come! In 30 days, I asked them to be realistic and accept this challenge. It wasn’t going to be easy as processed foods, sugar and sugar substitutes; alcohol and soda beverages were going to be eliminated. That was the tough part of the challenge. Online training was the easy part. Clients worked out in the convenience of their home. All you needed was space to workout, internet connection for Skype and a computer, laptop or iPad. We scheduled all the sessions before the program started so the clients were focused and had a plan for the fitness goals. 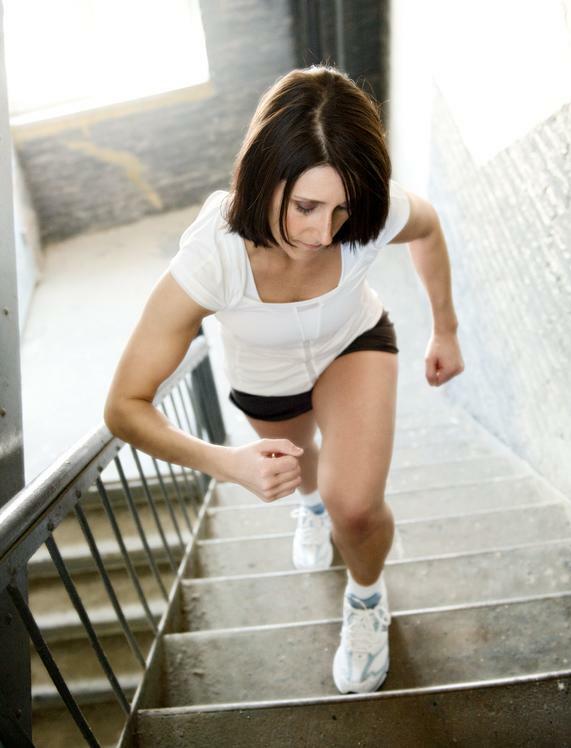 Each client determined his or her personal and fitness goal. For example, one client wanted to improve quality of life and flexibility. Another client wanted to lose weight in the waist area. The training programs were focused on each of their fitness goals. The results are great! I am pleased and clients are happy. This training was so simple and easy. Everyone had success with on line training. What fun would this 30-day challenge be if you didn’t reward yourself? Right? Before the program started, I asked every one to write down a reward. One client bought a new swimsuit; another bought a new workout outfit. All fun and no play makes for a boring life. Success comes with taking a few risks and being out of your comfort level. Starting off March with 66 Flights! 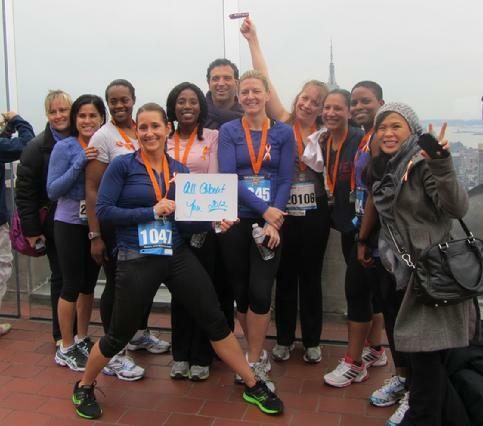 Thank you everyone who donated to MS and for supported my team as week climbed to the top of 30 Rock on Sunday March 3rd, 2013. It was a great time and we raised almost 9K. 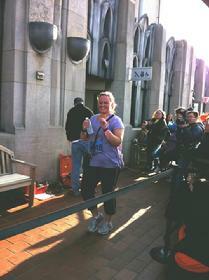 I am so proud of Sandy who raised more than $3K. My Co-Captain was the fastest and improved her time from last year. Yay! My new climbers were strong and successful. Yay!! Everyone made it to the top but weather was chilly so we quickly returned to the bottom to celebrate. Yipee Yay! 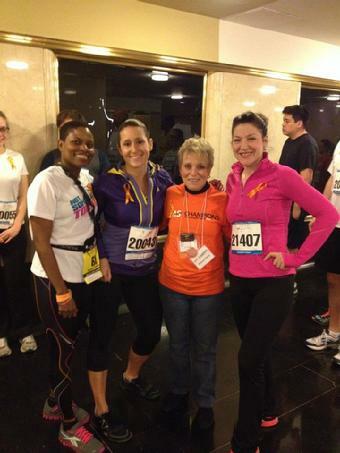 Moments before we start climbing the stairs, I was asked about the orange ribbons again. I kindly explained the "cure" shape and I made these in orange for it’s the color that represents MS. She proceeds to tell me that she has had MS for 30 plus years and appreciates all the hard work we are doing today. Quickly I responded with gratitude and gave her one of my ribbons to wear. She kindly thanked me with soft tears in her eyes. (Picture to the left) My team watched me and was more than ready to conquer 66 flights. Happy New YOU! Experiential Resolutions are different than typical New Year's Resolutions- which are based on to-do lists and behaviors. Write what you want to EXPERIENCE this year. What would you most want to feel on a daily basis? An hourly basis? Delight? Peace? Acceptance? Surrender? Love? Make it a self-fullfilling prophecy. You see what you believe in. Believe in Peace. Believe in Love. Believe in yourself. Make 2013 a year of experiencing your best self... and your best life. New All About You Classes starting in January 2013! All About You-Arms at Reebok Sports Club New York- January 19th for Members and Non-Members. Prices vary based on membership. 4-week class 12:30pm-1:45pm. Poster will be available soon. Shed Tread- Strengthing and Conditioning 6-week Semi-Private $240 starting January 13th, 4pm-5:15pm at Rockefeller Equionox. 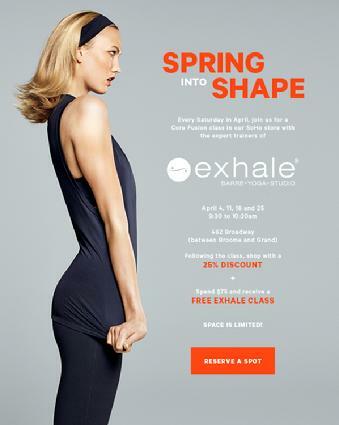 Equinox Members only. All About You.. Climb 2012. Amazing group. We had a blast. 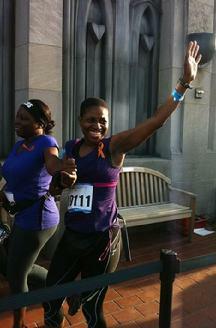 Thank you each and every one of you on my team and all those who donated to MS. 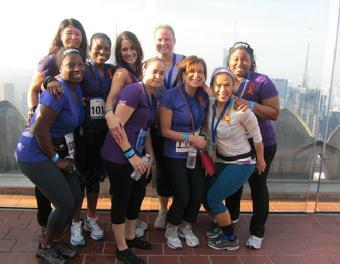 Thank you Team �all about you� for an outstanding Climb to the TOP of 30 Rockefeller and raising $8,321 for MS. I am still feeling the chills and excitement! Each and every one of you did an amazing job. As I take a moment to recapture Sunday, I must say our team was so exciting. 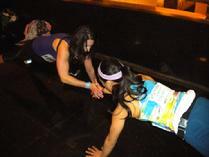 Carmel and I performed a few push-ups and planks while we were waiting in line. We chanted each of our names to ease our nerves and show support. 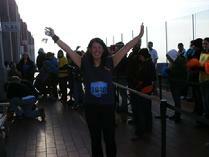 Carmel was our fastest to the top and she raised $2025. A special thank you goes to Carmel for inspiring us at the top with huddle and positive energy. 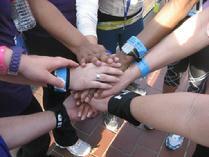 (Picture of our huddle is below) Carmen was the next to arrive at the top. Then next two friends Marsha and Sandy completed the climb with ease, laughter and fun (See middle picture below). Miriam shortly followed with extra energy in her vibrams. Way to go! Stephanie and Heidi are true MVP�s in my world. Each lady easily completed the climb and had MVP status (which means they raised more than $1000 before the 15th of February). Whoo hoo.. Awesome! (Picture below is of Stephanie �feeling like a champion). Zuleika and I reached the top together. It was a slight battle at the 30th but Zuleika go her second wind by the 43rd floor. I was quite impressed. Around the 50th floor, we had to pause again. It wasn�t easy but Zuleika was determined to reach the top. I was there to support and encourage her and the rest of the team. I took her arm and hand while we moved slowly and steadily. Once we saw the light and felt the breeze, nothing was going to stop us now. I am so proud of Zuleika. She did it! Every one of our teammates was at the top waiting for us!!! Thank you. We cheered, cried and celebrated each of our success! A day I will always remember! I have to share this story with everyone! I am soo excited and proud of Stephanie! This fall I had the pleasure of meeting Stephanie at Club H where I started to teach a Monday morning Kick It class. 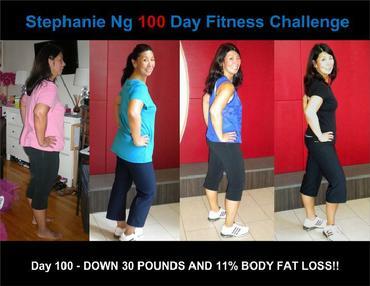 Stephanie informed me that she was going to do 100 day challenge which was programmed by Club H private trainer, Rachel. Luckily Stephanie voiced her interest in my class which allowed my class to be a part of her program. Weekly, I watched Stephanie's progress and continued to encourage her. And she met her goal early!!!! Stephanie loss a total of 30lbs and 11% body fat! Way to go Stephanie!!! You look amazing! I asked Stephanie, "How does it feel to lose this weight and what's your fitness goal for 2011?" Stephanie replied: "After losing the 30 pounds I felt so healthy and more confident in myself. When I look in the mirror I still say wow that's me I am proud of myself for this accomplishment. My goals for 2011 is continue to eat healthy and to lose more weight as well as help my friends who are looking to lose weight." Thank you for allowing me to be a part of your fitness program. You worked hard in class and it shows! Here's a picture of Stephanie's weight loss. all about you exercise for October 2010. 1. Position: Lay face up, palms to your side and facing up as well. Place both feet on top of ball. 4. Place right foot on top of left quad. Repeat 10 bridges in full range (all the way and down to the mat). 6. Finale� Raise top leg straight up in air and perform another 10-30, 1-inch presses. 7. Lower body and repeat single leg bridge combo with left foot on top or right quad. 8. Exhale as you lift your body up and be sure you stretch your hamstrings gluteus and calves afterwards.